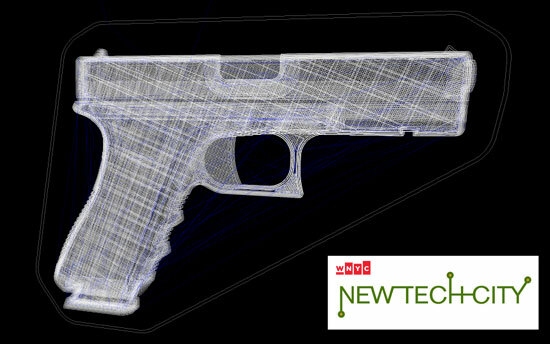 A few weeks ago I was interviewed by a reporter from WNYC for their New Tech City show about 3D printed guns. The one point I try to make (and that they generally fail to grasp) is that if it eventually becomes possible to download a file from a website, feed it to a printer, and have a fully operable handgun a few hours later, the technology will have already impacted our lives in far more incredible ways. Just think about that… We’re already making progress on printing human organs. Imaging printing a medical device that could save someone’s life, or medication, or your next mobile phone, or food, or any specialty tool you need. It’s potentially World Changing, so to focus on guns alone is just silly. You can check out the episode on their site: 3D-Printed Guns and Violent Video Games, or listen using the embedded player below. Posted on Tuesday, January 29th, 2013 at 1:06 pm. Subscribe to the comments feed. Both comments and pings are currently closed. Post on your own blog. What are your thoughts on WikiWeapons, open source weapon design, and 3D printed guns? Email chris.fox@advantagemedia.com . Tad/Chris(? ), I think the people behind the WikiWeapons thing are ignorant and irresponsible, but if you are intelligent and responsible, I’m not against you creating 3D printed guns, but I’ll admire you a million times more if you 3d print something that could help make the world a better place. I’m not convinced guns will do that. Really intesting quote there. As a mechanical engineer, I believe that 3D printing will be absolutely huge – at some point. As you allude to, it’ll be a long time before it replaces a milling machine, longer still a grinder. Not that I wouldn’t enjoy having a 3D printer, but I’m still quite happy with my “old school” CNC router.